MAPS – masses of them! Click on the maps below for a large scale view – and then again for a really detailed look. Click above for an AA Road Report from the RBC read by Joy Cameron-Dow. Southern Rhodesia 1927 at 1 : 1 000 000 scale. Among points of interest are: The Pioneer Road is shown as Selous Road after the chief scout who guided the Pioneer Column. The road to Chirundu and Kariba goes no further than Urungwe and of course Karoi did not then exist. The site of Beitbridge, which had not yet been built, is between Middle and Main Drift roughly where the BSAP post is located. Click on the desired region to get a detailed map of that area. A selection of some of the more interesting areas at 1:50 000 scale. Extract of Salisbury district from 1909 mapping of Rhodesia at 1: 500 000 scale The above series of maps was compiled in the office of the Surveyor General, Southern Rhodesia and this extract shows clearly the farms established by 1909. Pioneer Road from 1895 map of Rhodesia at 1 : 1 000 000 scale This map shows both the original pioneer road and the very slightly more direct telegraph line. The site of Beitbridge is between Middle and Main Drift and I have marked it “B B” across the river. Ministry of Roads and Road Traffic – Maintenance 1977/78 This map shows the status of all main roads with distances to the nearest 0,1 km. Sadly it does not include the old strip roads many of which were still in a good state of repair and perfectly usable! Extracts from two early maps of the Melsetter area. The maps above from 1895 and 1900, at a scale of 1:1,000,000, show the Eastern District when it was first being opened up. The second map of the same area and scale shows some changes as at 1900. Notably the building of a road and telegraph line from Umtali to Melsetter village and from there a road to what must then have been an extremely remote BSAP post near where the Mt Selinda Mission was later established. In 1898 a border agreement with Moçambique had been signed with Portugal at Macequece more or less along present lines. 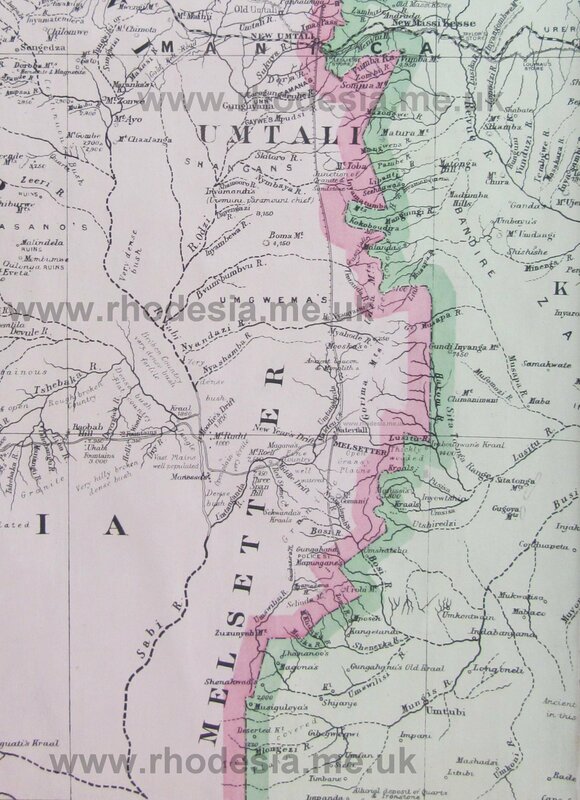 Sadly for Rhodesia in many places the line was to the west of what had been hoped for. The final, present day, boundary was not finally agreed until late 1940. The other points of interest on both maps are the descriptions which actually well convey the nature of the land concerned. That for the area around the Tanganda River between Middle Drift and New Year’s Drift being marked: “Fine Country well watered”. 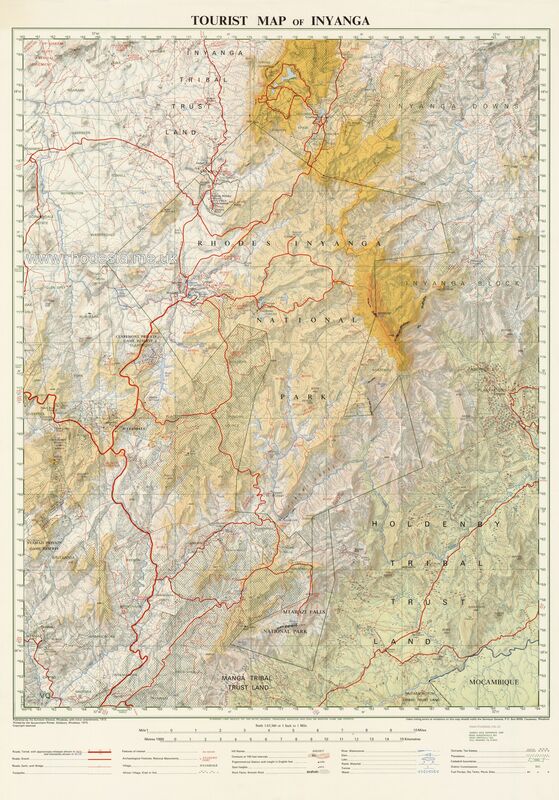 The above mapping was first published in 1929 with the northern third of the map partially revised for major changes in 1944 and the remaining southern section similarly revised in 1947. Thus the Birchenough Bridge, at the bottom of the map is shown; having been opened just before Christmas 1935. At this stage, although hill features are shown, there were no contours marked. 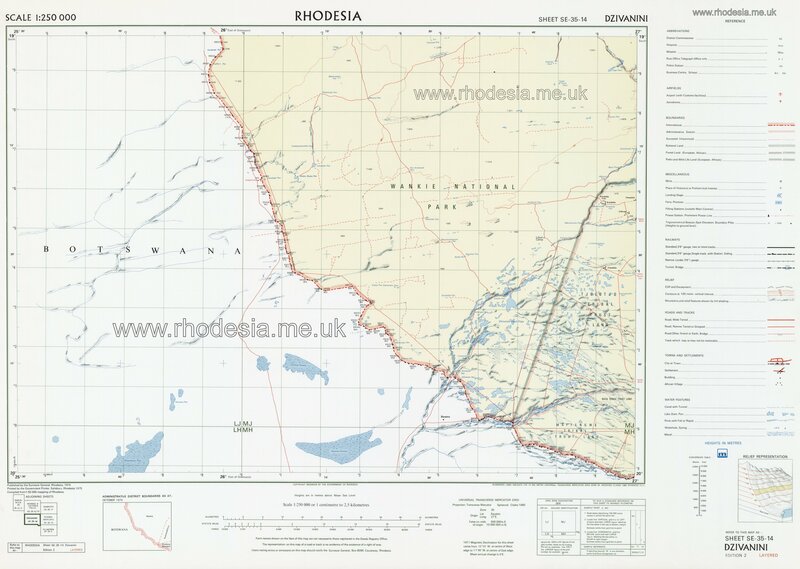 Map of the Federation of Rhodesia & Nyasaland showing main centres and lines of communication. I have had a number of requests for printed copies of various maps. I have had my own originals of these maps professionally scanned on a large format scanner (at no little expense!) so that I can present what you see on my web site. Most of the maps are from high resolution scans and would print well. The problem arises in that they would require similarly large format printers to print to. I am afraid that as I do not have the necessary large format printer, I am not able to provide prints. In that regard, if you could find such a printer nearby, you would do best simply to download the map and ask them to print it but that might not be cheap for a one off. Although, if you would be happy with A3 size, you could probably find an A3 size printer fairly easily and this might not be too costly. 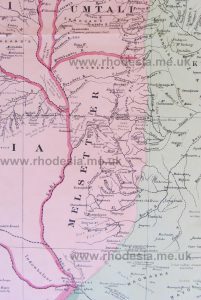 My other suggestion for those who seek a good quality printed map of Rhodesia is that you consider obtaining a copy of the Land Tenure Map an example of which you can see near the top of this page. 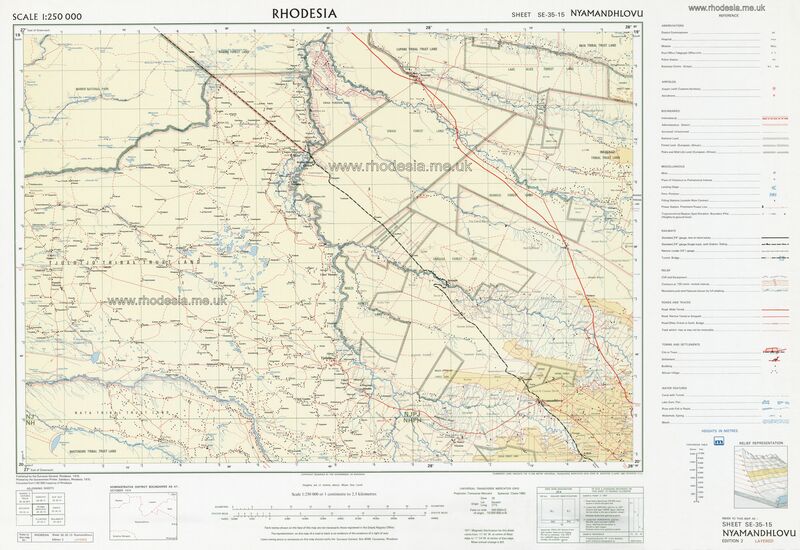 The Rhodesian Services Association, based in New Zealand, has had a batch of the land tenure maps printed at a reasonable cost. 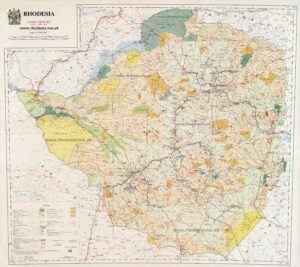 This map is very colourful and was used widely throughout Rhodesia. If you click on my example, you will see the amazing amount of detail shown. If you decide to buy one, please do mention my name or web site – although I get no commission! with approximate percentage of African population. 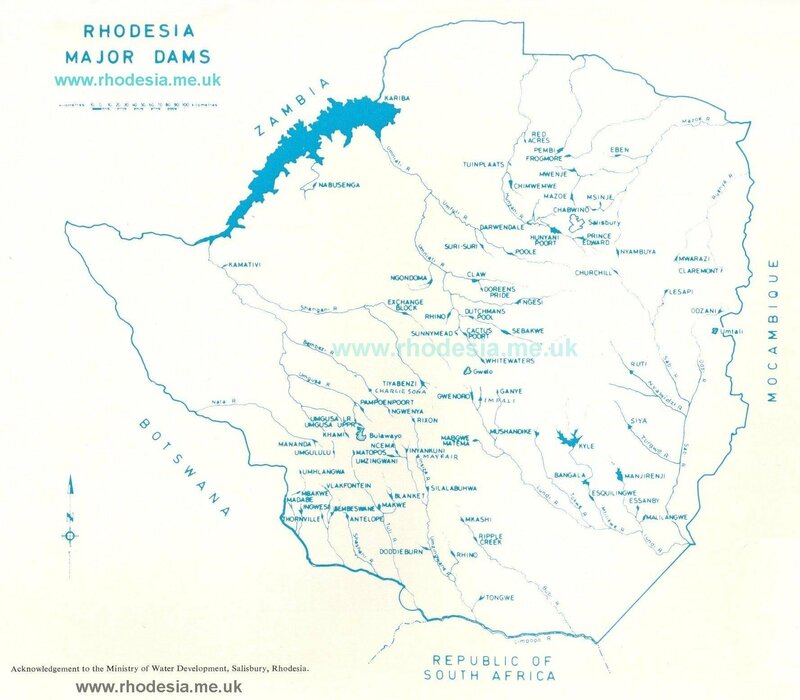 Quite a number of original Rhodesian names still appear on various current maps, however, to assist future readers in locating Rhodesian towns, rivers and dams on present day online maps etc. the following is a list of some of the more important name changes which were made from 1983.